This project is the first half of a Linked Open Data Fellowship, a joint effort of the Whitney Museum of American Art and the Pratt School of Information. Our goal: to explore potential linked open data projects for the Whitney using their rich data on artist and objects of the permanent collection. As a trial, a small portion of the collection was chosen for building and modeling linked data. Focusing on the early years of the Whitney’s collection,1931-1948, specifically the years under the guidance of the museum’s first director Juliana Force. Many of the artists during this period are obscure and available biographical information is scarce. It was important to congregate this information into a single location so that it will be useful to the curatorial staff and serve as a model for future data projects using the entire collection. 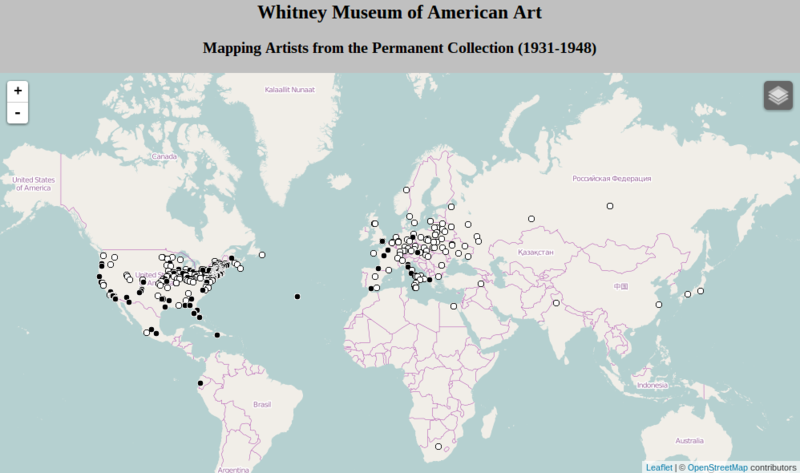 The initial data was taken directly from The Museum System (TMS) at the Whitney. This data needed to be cleaned and checked for errors before beginning linking to other data sources. Three areas were identified as important to the Whitney’s research staff: people, places, and objects. Much of the biographical information for the artists (people) was missing and required additional research to fill in gaps. This newly cleaned and augmented data was bolstered in two manners using API search queries.